So last sunday morning we were deposited by taxi outside Hua Lampong Train Station in Bangkok. The train didn’t go till 0805 hrs so we were early, a very unusual thing in our household. The night before I asked the ever friendly reception staff at The Cabochon Hotel how long it would take by cab to the station. The three of them considered the question and then came up with , one hour, 30 minutes and 15 minutes. Sunday morning I said, yes but all stuck to their guns. 7 kms by road I said but they were not for turning. take the Skytrain and the metro said the guy in charge. you will carry the bags I asked and we were back on taxis . In the end we went with 7a.m. and 10 minutes later we were on the platform ! Mind you the cab driver obviously freed on a Sunday morning from the usual gridlocked traffic system decided to show us his Sebastian Vettel aggressive driving techniques and we took on all challengers including a few buses in our dash there. Still 80 baht ( £1.60 ) seemed a bargain and we had time for a coffee before the train left. At 8 a.m. there was no sign of the train as we and crowds of others stood looking expectantly up the line. This train goes all the way south to Surat Thani arriving there at about 5 p.m. so I expected something pretty substantial to come in with loads of carriages and some huge engine at the front. I was surprised when in chugged a three carriage little diesel train. you know the ones with the diesel engine under each carriage that do little commuter routes in the UK ? Can’t be it I said knowledgeably to Geraldine they must be changing the platform . No one else shared my view and belongings were being gathered as it came to an halt. I don’t know if you have seen Dr. Zhivargo but there is a scene in that when the train arrives at Moscow station and people start to rush to the doors to get on the cattle trucks . This was like that. You would have had no idea we all held tickets with seat numbers already reserved. People were throwing children up the stairs lobbing suitcases up there anything to get themselves on the train. It is of course infective and I almost threw Geraldine into carriage 1. Our reserved seats were taken by a couple of Scots who seemed reluctant to move to their allocated seats and spent the rest of trip glaring at us from two rows back as if some how we had managed to get one up on them. The train is air conditioned and each carriage has about 74 seats plus a galley with a stewardess . The ground staff load a microwave into each one and a load of pre packed food and by 8.15 we were on our way. Like almost every main line station route out of any huge city this one is equally depressing. Rows and rows of shanty town wooden huts and small houses nestle right up to the track . Each however had a satellite dish on the roof. Quickly the trolley was out and coffee and water served . Not bad for £10 I said to Geraldine . 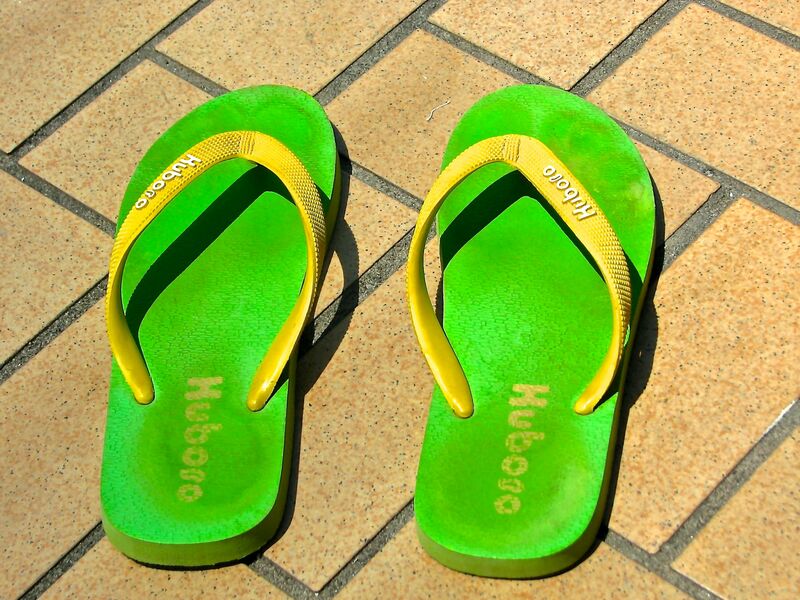 Rail fares are cheap in Thailand. 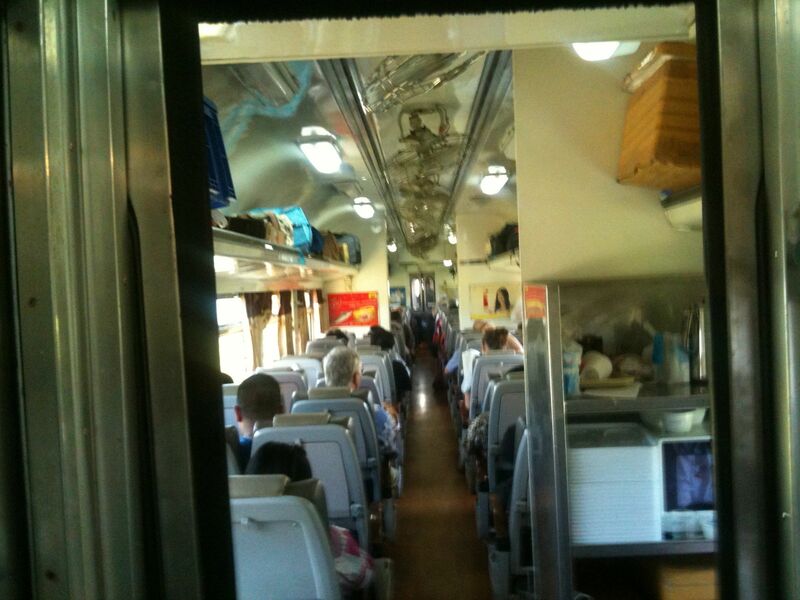 The train cantered through downtown Bangkok stopping at unpronouncable stations and a few more passengers joined . Then once in the open countryside like the Master of the Titanic the driver obviously said to his three colleagues ( there is also some overmanning on Thai railways)” let her have her legs lets see what she can do first officer” or the equivalent in Thai and we increased our speed to some 45 MPH . We chugged through endless paddy fields as the train slipped further and further behind schedule ( Thai trains don’t run on time) . Lunch was wheeled out on the trolley and everyone got an airline style meal cooked in the microwave. The carriage is set up 2 seats by 2 seats and everyone has a fold down tray except the bulkhead seats. No guesses where we were seating. Bulkheaders balance their meal, glass of water, hot coffee etc on their knees as the train sways along down the track. We declined the meal as I tend to drop that kind of thing according to Geraldine. The Scots continued to bore holes in our backs even though we clearly had the infirior seats. The view from the back and you can see the bulkhead seats, on the right is the galley. The air conditioning is vicious and if you do the trip take a sweater to wear. in fact the only thing that prevents the entire train going down with frost bite is the that it only really works when the train is bouncing along at full tilt. Any change in engine pitch like slowing down or speeding up is clearly too much for the system and it goes off. Thank god I have to say as I hadn’t got a sweater and had no hot food to help either having declined the meal . Mind you I dread to think the mess I might have made. By Hua Hin we were 40 minutes behind schedule. Loads got off there but all the seats were quickly replaced this time by mainly back packing foreigners heading south to Phuket and Ko Samui I was somewhat amazed to find that Baan Krut our destination was still 90 minutes away. Where on earth had I managed to book. Still they said in the blurb it was unspoilt I said to a sceptical Geraldine. 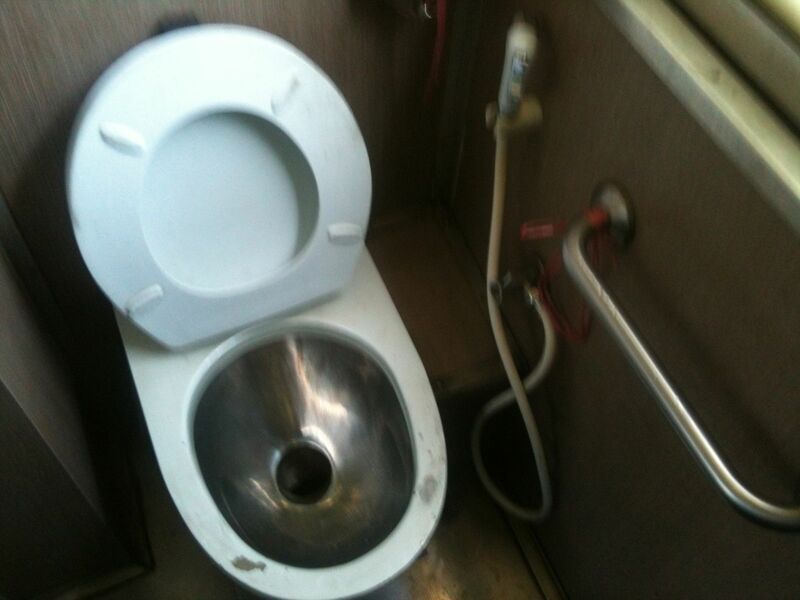 The loo is not an hole in the floor but flushing is by using an hose which on a train rocking and rolling south can lead to a rather wet pool like floor and fitments. Add to this the male propensity to stand even though the train is leaping about and it is probably not somewhere for girls to go. But hey I’ve seen a lot worse than this one haven’t you ? We arrived at Baan Krut 60 minutes late and were met by two hotel staff and stacked into the back of a small truck .The town was almost non existent and soon we were out on an empty road heading for the Ban Montra Resort ( can I find them ). As we arrived a taxi was pulling up and from it came an Aussie and his Thai wife . ” Where the expletive are we ?” he asked . “jesus Christ this is the bloody back of beyond.” They had booked it thinking it was just outside Hua Hin and instead of the 3,000 baht they had agreed with the cab guy in Bangkok he now wanted 8,000 baht ( £170 ). More good old Aussie expletives and they and we were checked in. The four of us were the only people in the hotel as it turned out. Well they said it was quiet.